A Customer Data Platform (CDP) holds the promise of providing a single, 360-degree view of the customer, unifying data from an array of touchpoints and making it accessible to digital marketing and engagement platforms. Sounds great, right? Well I'm enthusiastic, too, but let's all temper our enthusiasm. Here's why. Download a free detailed vendor evaluation for CDP. Attracted by the buzz around market potential and attendant venture capital funding, newly-formed companies entering the fray as CDP vendors are subject to all the challenges and risks associated with start-ups, from coping with rapid growth to reconciling investor ROI with providing long-term customer value. New vendors tend to lag in critical "strategic considerations" around customer ecosystems, channel partners, customer support, and roadmap uncertainty. 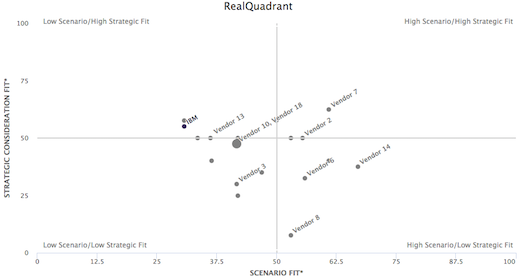 Consider the quadrant below, generated by RSG's RealQuadrant decision support tool. In this case, we use a generic basket of business scenarios (X axis) and standard weighting of strategic considerations (Y axis) to generate the results. What's interesting is how "saggy" the marketplace is: vendors tend to score more poorly on strategic fit. This doesn't mean you shouldn't invest in CDP technology. It does mean you should think about risk mitigation. Many CDP vendors have arrived in this newly-defined space from adjacent businesses like tag management (Tealium), marketing/campaign automation, ad retargeting/bidding (Vizury) or data assembly (Quaero). In the meantime, many vendors in adjacent segments — including WCM, Portals, Journey Orchestration, and Business Intelligence — are also building CDP technologies into their platforms. We tend to counsel separating customer data layer from your interaction layers, but in any case, make sure your chosen vendor’s focus aligns with yours. Some vendors' sole focus is on CDP offerings, others offer additional functionality, such as predictive analytics, campaign management, web personalization, or multi-touch attribution modeling. This can affect how they've architected their CDP offering and may impact how well they fit your environment. It could also lead to serious functional overlap for you. So get clear about business priorities, then buy only what you need. Security comes into high relief here for several reasons. CDPs contain customers' personally identifiable information (PII). The systems are designed for ready access and data interchange, as well as marketer control. Some CDP vendors address security issues more directly than others, but as always, security is more of a practice than a feature. This is a fragmented marketplace, so you have lots of choices. That's a good thing, but you'll want to take the time to make sure you're focused on the right fit. RSG can help you with your analysis. We always sit on your side of the table, and will tell you straight up when you don't need technology. If you've gotten this far in the blog post, you may already sense your enterprise isn't ready for a CDP, or the marketplace isn't ready for you. If and when you are ready, RSG's hard-hitting vendor evaluations provide the real story about when a particular solution might match your needs, or more importantly, where it may fall short.